The dates for the 2020 Florida Ospreys tour are March 28th-29th. Are you ready to photograph Ospreys in their natural habitat from a boat on a pristine lake? 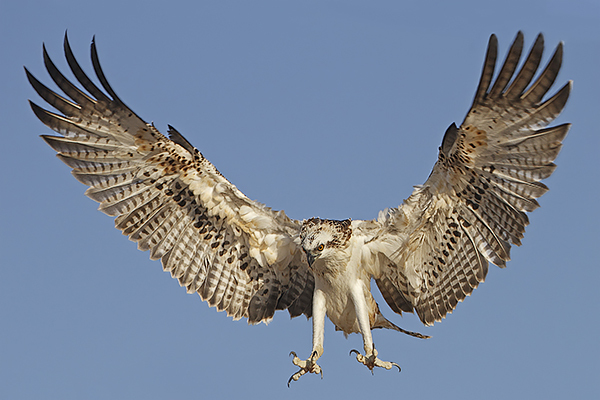 The workshop will be located East of Orlando, on a lake with the highest concentration of Osprey nests in Florida. We will shoot from a pontoon boat and will be able to get fairly close to the birds without disturbing them. Not only, there will be many accessible nests, but many of them are not located too high. Also, we will be among cypress trees, which will give a true natural feel to our images. While it is possible to see many Osprey nests across Florida, most are now located on man made poles or are very high in the trees. This is a unique location and there are only four participants! Everybody will have comfortable space to shoot from the pontoon boat. Being able to approach fairly close to low altitude nests is the best way to capture intimate exchanges between the mating birds. This is a difficult vantage point to achieve. There will be many landings and take offs, giving great opportunities for first class action shots. If the wind is blowing in the right direction, we might even be able to create face to face landings. Ospreys exclusively eat live preys from the water. They are prime fishing birds and you will be surprised by some of the feats they may pull off. On top, three fish in the talents! You will learn how to nail down exposure, compose and position yourself in the best way possible each time. Understanding the light and making the most of your camera tracking system will be accompanied by taking into consideration wind direction and angling for the most pleasing background.